Sandwiched between Friday’s sporadic storms and a barrage of hip-hop and R&B yet-to-come on Sunday’s bill, Saturday’s offerings seemed to be Pitchfork Music Festival’s attempt to encourage attendees to take a few moments to relax. Much of the early afternoon was devoted to relatively calm performances, including the smooth melodies of local psych-pop act Paul Cherry, the tranquil synthesizer symphonies of Kaitlyn Aurelia Smith and the subdued grooves of young singer-songwriter Nilüfer Yanya. Local avant-garde folk outfit Circuit des Yeux provided the afternoon’s first extended bout of unbridled noise, unleashing a cacophonous crescendo from the Blue Stage that could be heard across the park as soulful singer-songwriter Moses Sumney encouraged fest-goers to dance while wrapping his powerful falsetto around delicate melodies on the main stage. Next, R&B veteran Raphael Saadiq showed up in one of the day’s most gregarious outfits to preside over a series of funky tunes and cover a J Dilla track (with the help of A Tribe Called Quest DJ Ali Shaheed Muhammad), giving way to an equally buoyant set from Blood Orange that channeled the rhythms and guitar heroics of Prince. 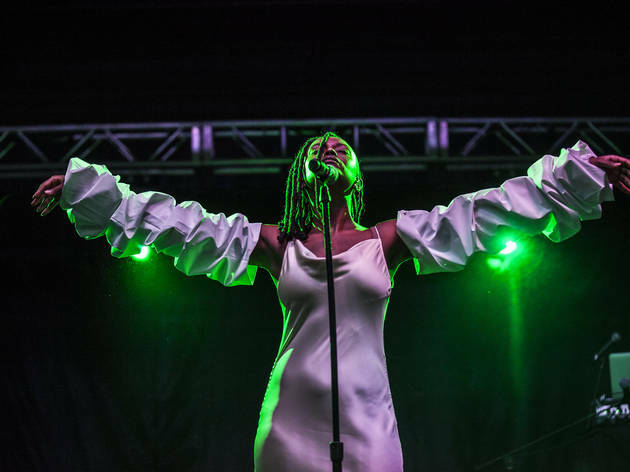 While the Blue Stage’s late-evening lineup hosted the freeform prog-rock of This Is Not This Heat and R&B singer Kelela’s soaring vocals (not to mention her synchronized dance routines), the bulk of the crowd was in the main field where War on Drugs doled out classic rock-indebted riffs. The Philadelphia outfit’s performance quickly established a rhythm, with each track essentially serving as a prelude for an extended guitar solo augmented by harmonicas, saxophones and synths—and judging by the sheer number of folks who showed up to take it in, it’s still a little baffling that the War on Drugs wasn’t tapped to headline the fest. A noticeably smaller assemblage gazed at the mountains, sunsets and celestial vistas that served as the backdrop for Fleet Foxes’s headlining set. Frontman Robin Pecknold and his band barreled through their performance, allowing songs to blend into and grow out of one another. Seven years removed from its last headlining performance at the festival, the group’s complex chamber folk arrangements and pristine vocal harmonies sounded as consummate as ever, but there was something a bit anticlimactic about Fleet Foxes’s second go-round atop the Pitchfork bill. While the placement was by no means undeserved, the show ultimately felt less like a momentous occasion and more like a pleasant, but not entirely satisfying encounter with an old friend. Take a look at photos from day two of Pitchfork Music Festival below.